In the Spanish, the relationship between common in-laws has its own vocabulary. Parents-in-law are suegros to the couple, and the sets of parents call each other consuegros. In the same way, the terms for brother-in-law, sister-in-law and so on, add "con" to the front to describe a relationship held in common. Language and culture go hand in hand. When we lived in Quito, our rental home was on the same property as our landlady's. I was always jealous when her extended family got together on the weekends and holidays. I wanted to be with family, too. Now that we're back in Canada, we're much closer, but still an expensive ferry ride and several hours from my family and a long, long day's drive from Tim's. So I still miss getting together with my siblings and parents as much as I'd like. However, as our family grows, our gatherings grow, too. Last Sunday, Mother's Day, we got together with our consuegros at our son and daughter-in-law's home. DIL's sister and her family were there, too. 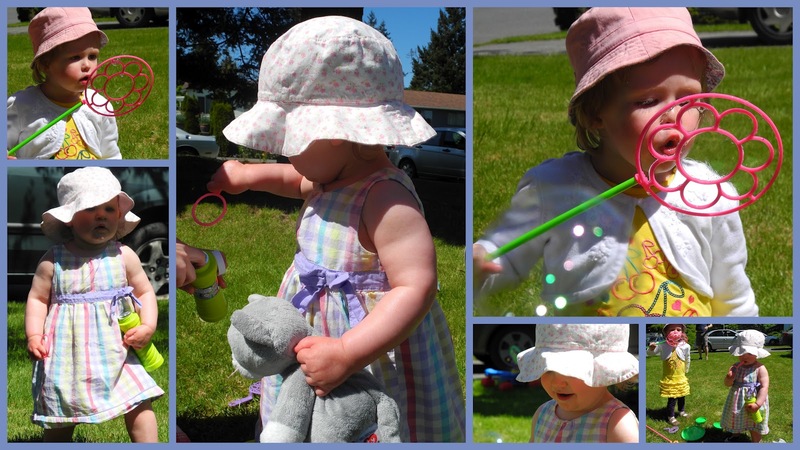 Our Little Miss and her cousin had a great time blowing bubbles on the lawn. I thought I had missed capturing any bubbles, but notice a few oddly coloured circles in the top right photo that must be bubbles. Little Miss is clutching her kitty - Mo Kitty, he's called, and goes many places with her. My potted tulips are lingering, dancing beautifully on long, elegant stems. I love this deep purple colour against the greens in my garden. Although I'm late to the party, I'm joining with with Mosaic Monday, once again hosted by Mary at the Little Red House. I was late in posting too - it was so nice yesterday...too nice to be indoors! How lovely it is for you to have a growing family here on the island. As our family expands to include a new SIL and his parents I am overwhelmed with happiness. More love, more family, more special occasions. Such a sweet mosaic and gorgeous purple tulips. Looks like a sweet time was had. That bubble blower is larger than your little miss. That was an interesting Spanish lesson. The tulips are an exquisite color. What a beautiful shade of purple those tulips are! And sweet grand babies ... I'm sure you cherish every moment with them. I know what you mean. My family and my hubby's used to get together every weekend. We're all too spread out now. Your tulips are stunning, Lorrie! J'adore ces photos d'enfants avec leurs petits bras tous potelés !! Tes tulipes sont magnifiques... ici les mulots mangent les bulbes donc je n'ai pas encore essayé. And I enjoy your mini-lesson on Spanish and the linkage between language and culture. Love the mosaic! What a cutie! Such adorable little girls having simple fun and a lovely day! This is the time to enjoy children - so happy you could be together for a while. Gorgeous tulips! I appreciate learning how another culture addresses family by mqrriage.